England are out of their own World Cup before the knockout stages following a devastating defeat by Australia at Twickenham. Even before the final whistle had blown, the inquest had begun - should England's head coach Stuart Lancaster lose his job? Should George Ford have started? Why didn't England have a specialist open-side flanker in their squad? There will also be questions about how the host country's early exit will affect the rest of the tournament and the sport's legacy in England. From World Cup-winners to the general public, just about everyone will have their say. Former New Zealand scrum-half and BBC Radio 5 live pundit Justin Marshall: "When you look at the way the Australian pack play, they're all distributors. Prop Sekope Kepu can pass as well as scrum-half Will Genia. And so can the locks and the second-rowers. But did we see any of that from England? Not at all." England World Cup-winner and BBC Radio 5 live pundit Matt Dawson: "I don't think you can keep the same management after that. You can't go out in the group stages of your own World Cup. Something needs to change. England were not disciplined. He could not coach a disciplined team to get out of that pool and that is why Stuart Lancaster should go." A new rock bottom for England? 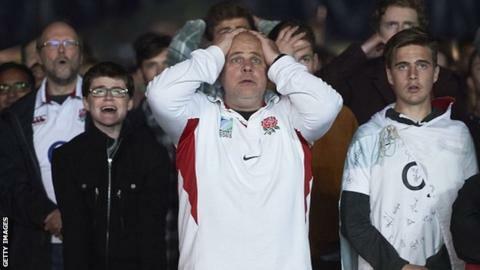 Read more on A new rock bottom for England after Rugby World Cup exit? What are the basics of rugby union? Read more on What are the basics of rugby union?